The new year always brings an onslaught of “healthy eating” recipes. I suppose I’m not different as this soup is fairly healthy. 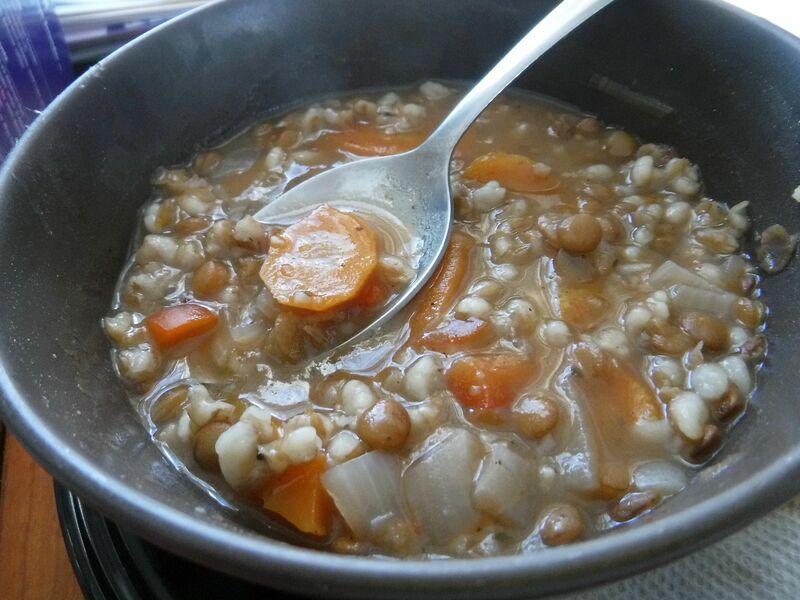 Lentils and barley both provide a decent amount of fiber and carrots are good for you, right. I use a reduced sodium broth base and then add salt at the end via sriracha and/or a bit of Parmesan cheese. As an aside, I like the concept of a slow cooker however in practice most of the recipes finish too quickly for them to be practical for me on a weeknight. When I work from home though I can take 10 minutes mid-morning, toss some ingredients together and then have dinner ready when I want to eat. 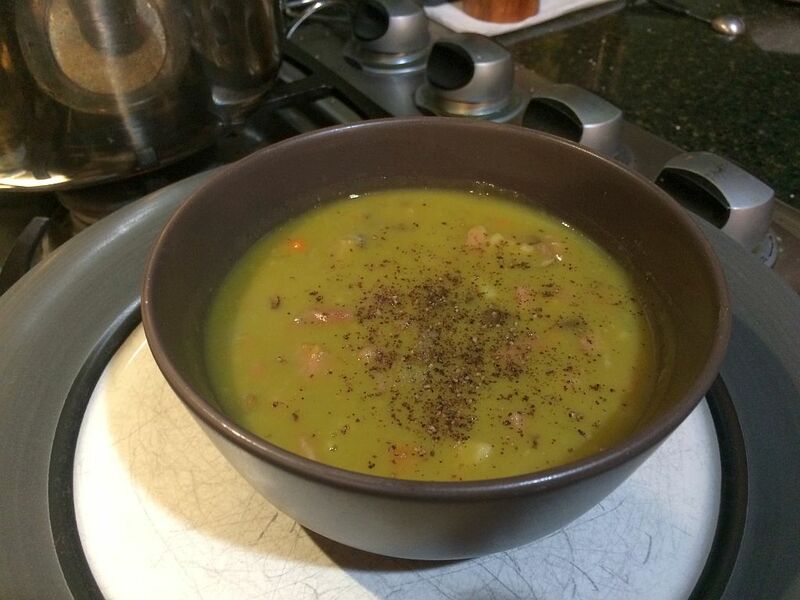 When we enjoy baked ham I typically turn the bone over to my mom who turns it into tasty split pea soup. I figured I’d return the favor this time around, picked up a package of green split peas and followed the basic recipe on the back of the package. I omitted the “ham-flavor seasoning package” included with the dried peas in favor of actual ham. I added the ham in two phases, some while cooking and the bulk after cooking. The pressure cooker will draw every bit of flavor from the ham; the second addition ensures that some of the ham you eat will actually taste as it should. Heat oil over medium-low heat in the pressure cooker. Add all the fresh veggies, sprinkle with a pinch of salt and stir to coat with oil. Cook for 3 minutes, stirring occasionally. Add the garlic, stir into the rest of the veggies and cook until fragrant, about 1 minute. Add the split peas, 1/2 lb. of ham and the water/stock. Stir once or twice two mix things up. Add the ham bone. Bring to a boil. Put the lid on the pressure cooker and lock. Bring up to pressure until steam is being released. Lower the heat to maintain pressure; a small hiss of steam should still escape the cooker. Cook for 20 minutes. Use the quick release to dump the pressure built up in the cooker. Use tongs to remove the bones from the pot. The bulk of the peas have probably settled on the bottom of the pot. Stir well until your spoon no longer brings up clumps of pea puree. Stir in the remaining ham and allow to sit for 10 minute. Taste for seasoning and adjust as desired. I like mine with lots of freshly ground black pepper. A bit of olive oil would be nice too. As an experiment I cooked the ham bone in 16 cups of water on low in my slower cooker for 9 hours while I was at work. It yielded a very weak stock. I used it to make the soup however I’ll probably just use water next time. This soup will thicken while it sits. When I transferred the leftovers to a container it was basically a blob. Worry not; add a bit of water, reheat and it will be lovely soup again. I love a lazy Sunday however most of them are packed with to-dos and running around. It’s nice to be able to spend 10 or 15 minutes prepping something with the sure knowledge that you’ll have a taste meal at the end of the day. Combine broth, fennel, onion, garlic, pork and bay leaves in the slow cooker. Cover and cook, on low, for 6 hours. Bump the slow cooker up to high. Add the spinach, tomatoes and beans to the cooker. Recover and cook for an hour. Remove the pork (and bones) from the pot. Chop or shred into smaller pieces and return to the cooker. Add the vinegar, stir to incorporate. Taste and adjust salt/pepper as desired. This soup is based on one from Campbell’s. I added a few things to bump up the flavor and reworked the instructions a bit as well. My frozen spinach didn’t thaw much after 6 hours in the fridge. I took a chance and added the mostly solid spinach brick to the slow cooker. It heated up fine and the soup seemed no worse for wear. In the fall one of my weeknight go-to meals is soup. It’s mostly a combine and simmer effort which is perfect after a day at work and the diminishing light of the day. Heat oil in a dutch oven over medium heat until shimmering. Add onions and a generous pinch of salt. Cook for 3 to 4 minutes until tender. Add brown sugar, spices and garlic. Stir to combine and heat until fragrant; 1 to 2 minutes. Add tomato products, broth and orange juice. Stir until tomato paste is incorporated. Reduce to a simmer and cook for 30 minutes, stirring occasionally. Add black beans, stir to incorporate and cook for 20 more minutes. Beans should be heated through and slightly softened. Taste for seasoning; adjust if needed. Serve with in a bowl with your choice of toppings. This recipe is based on one I found while sorting through the stack of recipes that get printed out, made once and forgotten. I’ve tweaked the original recipe to match my preferences and written up my version of the instructions. The original recipe apparently came from Southern Living magazine circa 2008. Cooler weather lends itself to warm soup. Below is a basic vegetable soup recipe that I’ve turned to over the years. It is easy to extend with additional vegetables and while it is vegetarian there’s no reason it can’t become the base for some meated creation. Preheat oven to 400°F. Toss sweet potato cubes, 1 Tbsp. oil, a healthy pinch of salt & 1/2 tsp. black pepper together until sweet potatoes are evenly covered with oil and seasonings. Spread on a rimmed baking pan and bake until just tender (~30 minutes). Set aside. In a large soup pot saute the carrots, celery and onion in the remaining oil until the onions become translucent. Add the broth and water; bring to a boil. Drop to a simmer and cook for ~30 minutes. About 20 minutes before eating turn the heat back up to high. Once at a boil add the pasta and cook per the instructions on the box. When the pasta is done to your likeness add the added the roasted sweet potatoes to the soup. Reheat potatoes if necessary and serve with grated Parmesan cheese. We had some vegetable broth in the freezer so I used that for this recipe. That said I often use Better Than Bouillon Vegetable Base. Just add a tablespoon of the concentrate to a quart of hot water and you’re ready to roll. 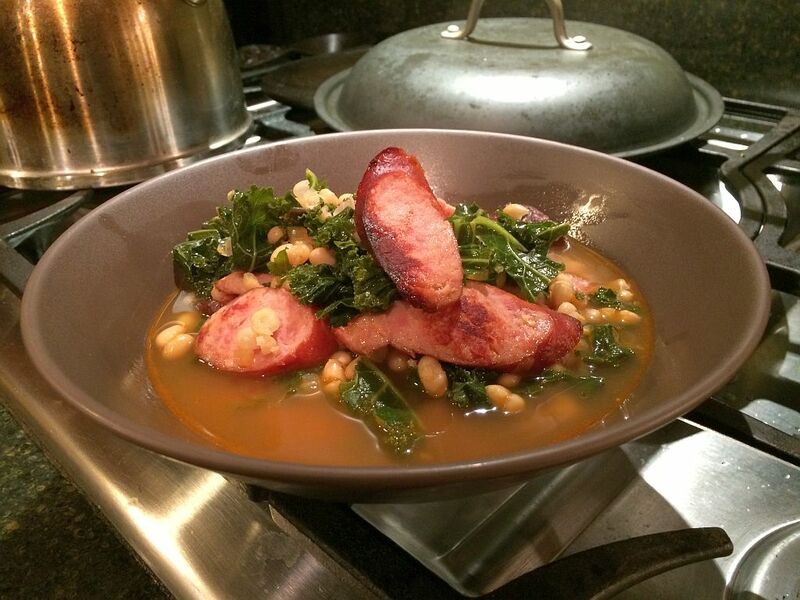 This is a go-to favorite for any of the following reasons – it is rainy/cold/damp, we found some nice kale at the farm stand, we bought interesting sausages from the food co-op, we wanted something that cooks up quickly, we had a bad day, or we just wanted to enjoy it again. The farm stand near where I work has had some great peppers this year. In addition to the usual green and red ones there are this yellow-purple variety of bell pepper that has been fantastic. As the growing season winds down I wanted something to celebrate the taste of the pepper. The resulting soup as quite thick and surprisingly creamy. My husband looked at me and said it was the lentils. Whatever it was I’m happy with the result. Rinse and pat dry the peppers. Roast them over the flame of a gas stove, on the grill or in your oven under the broiler until the skin is thoroughly blackened. Transfer charred peppers to a bowl and cover with plastic wrap for 20 minutes. After 20 minutes remove the charred skin, remove the top and seeds and roughly chop the peppers. Add the oil to a sauce pan and heat over medium. Add the onions and a pinch of salt, toss to combine. Cook for 4-5 minutes until the onions begin to turn translucent. Add the apples, garlic, spices and several grinds of pepper. Stir to distribute the spices. Add the lentils and the water. Stir again, scraping any lentils that try to climb up the side of the pan back into the water. Cover, reduce heat to low and cook for 15-20 minutes. Check the lentils after 15 minutes. If they are soft to the tooth then continue to the next step; if not cook at bit longer until soft. Transfer about 1/2 of the soup into a blender and puree on high for about 2 minutes (see note). Place the pureed soup in a bowl and repeat the process with the remaining soup. Taste the pureed soup for salt and pepper; adjust as necessary. Serve up with toasted bread or some crackers. When using the blender on hot food it is important to provide the steam and pressure a way out of the carafe. If you don’t the top is likely to pop off your blender and your soup will decorate your walls. Our blender has a clear knob in the center of the cover that can be removed to pour liquid into the running blender. I remove the knob whenever I’m going to blend soup or other hot food. To keep the soup in the blender I fold a clean towel into a square and hold it over the hole in the cover. My husband thought that the soup could have used a bit of texture. Some chopped green tomatoes would have been a nice addition; I didn’t think of it until after we were eating. Looking back I noticed I made a red pepper soup last year. This one was more savory than the previous one. This one also has no dairy.